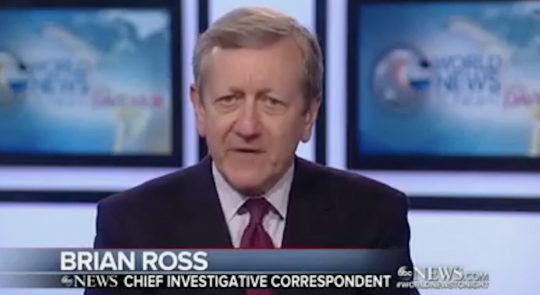 ABC News has suspended reporter Brian Ross for four weeks without pay for his erroneous report on Friday about President Donald Trump, Michael Flynn, and the Russians. Ross initially reported Friday that, as a candidate, Trump directed Flynn, his future national security adviser, to make contact with the Russians. This apparent bombshell report about potential collusion between Trump and the Kremlin sent the stock market tumbling, but the story turned out to be false. Ross went on "World News Tonight" Friday evening to state his source told him it was President-elect Trump who issued that directive to Flynn, not candidate Trump. It is common for presidential transition teams to make contact with foreign governments as they prepare to take power. "We deeply regret and apologize for the serious error we made yesterday. The reporting conveyed by Brian Ross during the special report had not been fully vetted through our editorial standards process," ABC said in a statement, according to CNN. "As a result of our continued reporting over the next several hours ultimately we determined the information was wrong and we corrected the mistake on air and online." "It is vital we get the story right and retain the trust we have built with our audience–these are our core principles. We fell far short of that yesterday. Effective immediately, Brian Ross will be suspended for four weeks without pay." Flynn pleaded guilty this week to lying to the FBI about his conversation with the Russian ambassador last December, and he is cooperating with Special Counsel Robert Mueller's expansive probe into Russian interference in the 2016 election. ABC initially tweeted a "clarification" of Ross' original eport on Friday before ultimately calling it a "correction." CNN reached out to ABC employees who expressed dismay at the significant reporting terror. "It's a major embarrassment," one employee said. "It makes me cringe," another employee said. "This is not what any networks needs when people are so quick to say ‘fake news' to you. It makes me sick to my stomach." This entry was posted in Politics and tagged ABC, Donald Trump, Michael Flynn, Robert Mueller, Russia. Bookmark the permalink.